The Next Small Cap presents this information for the use of readers in their decision to engage with this product. Please be aware that this is a very high risk product. We stress that this article should only be used as one part of this decision making process. You need to fully inform yourself of all factors and information relating to this product before engaging with it. 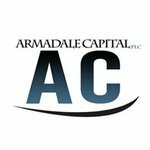 The majority of opportunistic graphite explorers that made early moves to secure favourable graphite exploration tenure have all been ASX or TSX-listed — but there is one UK-based company that wants to be part of the pecking order – Armadale Capital (LSE: ACP). 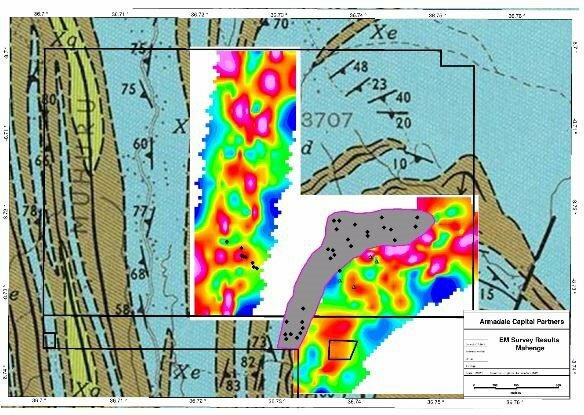 Since we last wrote about ACP just over a month ago, the company has released positive drill results that has confirmed a thick graphite schist deposit, while preliminary modelling has indicated a potentially substantial sized graphite resource. Initial assay results have also been released showing high-grade graphite mineralisation up to 26% Total Graphitic Carbon (‘TGC’), commencing from or near the surface at the Mahenge Liandu Graphite Project in Tanzania. ACP’s completed drill program confirmed that 18 from 21 drill holes at Mahenge were visually logged as intersecting high grade coarse graphite mineralisation. That certainly points this Tanzanian play in the right direction. Before we go too far, it should be noted that for political and social reasons, this is a very high-risk stock. Getting mining projects up and running in countries such as Tanzania is no simple feat, and there may be challenges ahead. As well as good drill results, the macro outlook is also working in ACP’s favour. Graphite is captivating the imaginations of a host of end-users including consumers, producers and investors as electric car manufacturers in particular bring new paradigms to traditional ways of doing things, like driving. There are similar companies to ACP already capitalising on this sentiment, which indicate the pathway for share price appreciation for this stock. 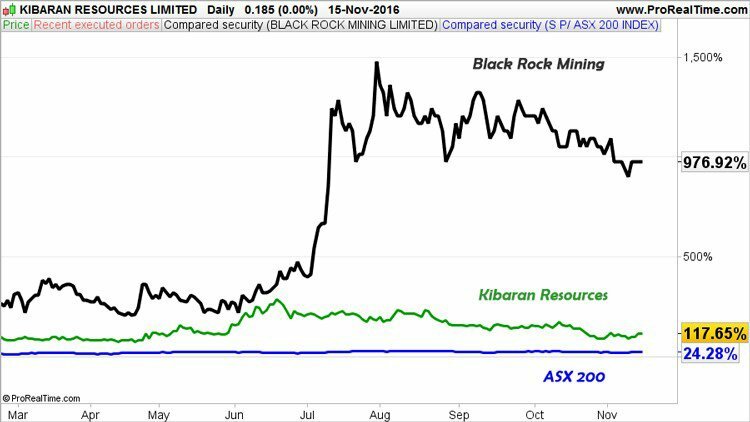 The likes of the £27.1M (AU$44.8M) Kibaran Resources (ASX: KNL) and £27.3M (AU$45.2M) Black Rock Mining (ASX: BKT) in Australia, were both teeny graphite explorers barely 12 months ago, but have made quick progress in their exploration and have therefore raised their valuations significantly. ...and ACP hopes to repeat the feat on UK’s AIM because of its unique status of being the only AIM-listed company currently digging for high-grade natural graphite. With a maiden JORC Resource looming before year-end and preliminary drilling results suggesting grades well in excess of 26% TGC, we think we may have found a high potential small-cap stock that can grow itself into a commodities cash-cow for its foresighted Management team and early investors. 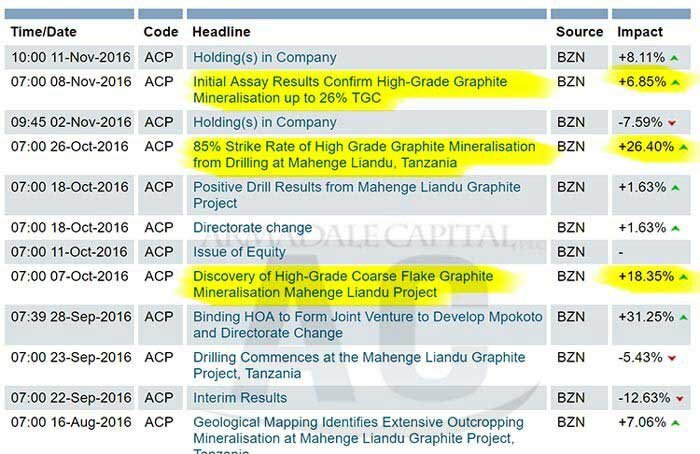 Armadale Capital (LSE: ACP) is nearing a price-sensitive critical moment in the early development of its flagship graphite project in Tanzania. So far, preliminary assay and JORC modelling results indicate that ACP is on course to post a substantial, high quality coarse flake graphite Resource at Mahenge Liandu in Tanzania. We wrote about ACP’s graphite lustre as recently as last month , where we delved into the specifics behind why this graphite junior had the minerals to mature into a graphite powerhouse over the coming years. The hot news off the press is that ACP’s drill-bit is hitting high-grade mineralisation consistent with early expectations and possibly more importantly, 85% of drill-holes are striking graphite mineralisation. If we look at the latest drilling results from ACP’s exploration, hopes for a re-rating later this year are high. The below chart shows the price action since June 2016. 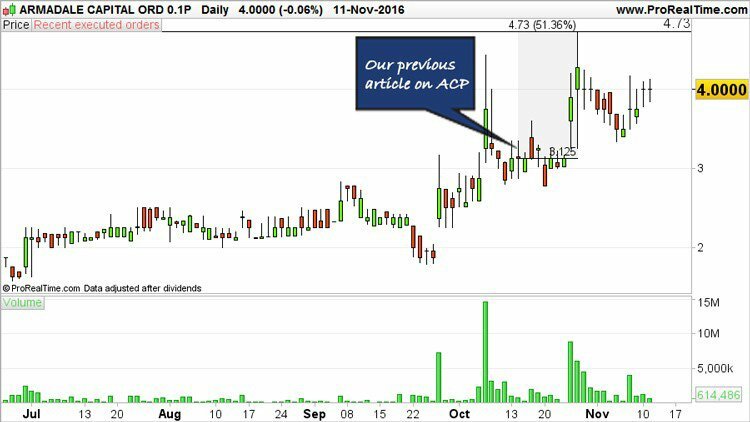 We last wrote about ACP in October , since then the stock has been up as high as 4.73p – that’s a gain of over 50% in just a few weeks. The reason for this is down to the drilling results that confirm strong grades at relatively shallow depths. 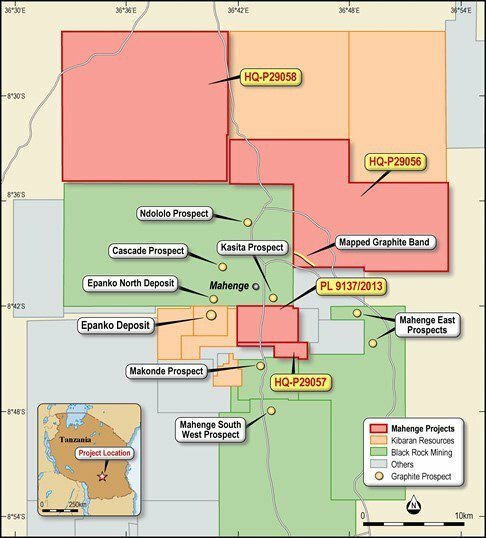 18 out of 21 drill holes at ACP’s Mahenge Liandu project intersected high-grade coarse flake graphite mineralisation — marking a very successful maiden reverse circulation drilling campaign. With the first bout of exploration now coming to an end, ACP is clearly positioned as the only AIM-listed resource company with direct exposure to natural graphite. However, this is an early stage play with a long road in front of it and investors should take a cautious approach if considering this stock for their portfolio. 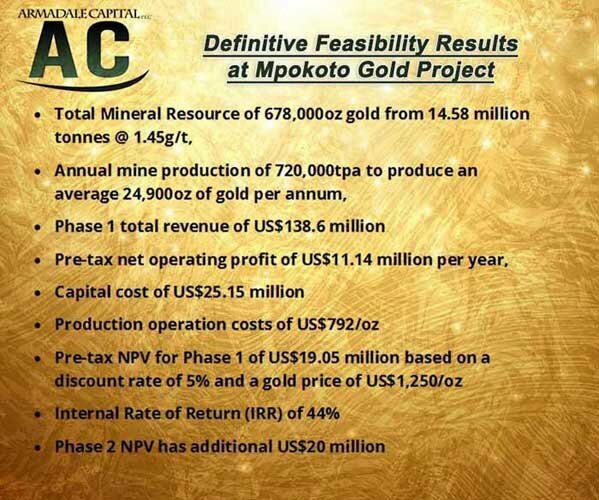 ACP hopes it will define something similar to Kibaran and Black Rock, and all indications are that it may well do so. 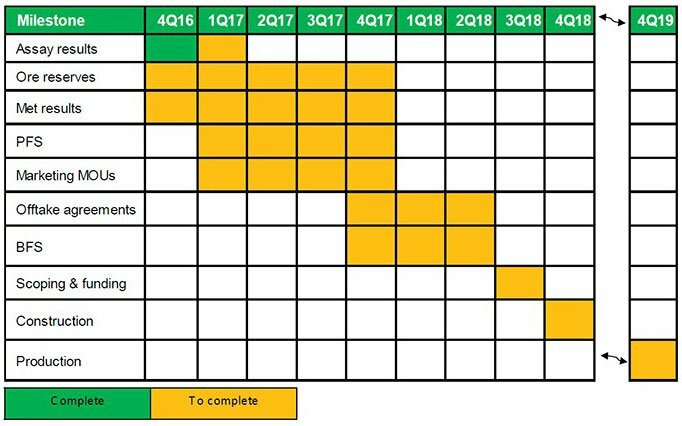 The next 1-2 months are therefore critical for ACP. Carbon concentrate of 96.3% TGC. One of the standout factors that ACP can take great confidence from is Kibaran’s off-take agreements with Japanese trading-house Sojitz and German multi-national conglomerate ThyssenKrupp. The signing of these contracts validates the mining potential in Tanzania and proves that graphite sales are not just a pipe dream, but rather an increasingly common sight as more manufacturers adopt graphite and graphene into the production lines. The Mahenge Liandu project is located in the Ulanga District in south east Tanzania, approximately 300km south west of Morogoro and 10km from the town Mahenge. ACP is sandwiched right in the middle of all the commercially-alluring drilling currently going on in Tanzania — four tenements covering 485km 2 to be exact. Labour and materials available within 10km at Mahenge township. High grade graphite mineralisation of up to 33.8% TGC has been demonstrated through analysis of rock chip samples taken from Mahenge Liandu in June 2016. Previous drilling has confirmed high-grade mineralisation from the surface, with results including 60m @ 10.7% TGC including 24m @ 12.9% TGC and 5m @ 21.5% TGC . And what is all the drilling and exploration being done for? ...to hopefully supply one of the most incredible transformations from fossil-fuels to clean, battery-assisted energy made possible by lithium, graphite and cobalt. 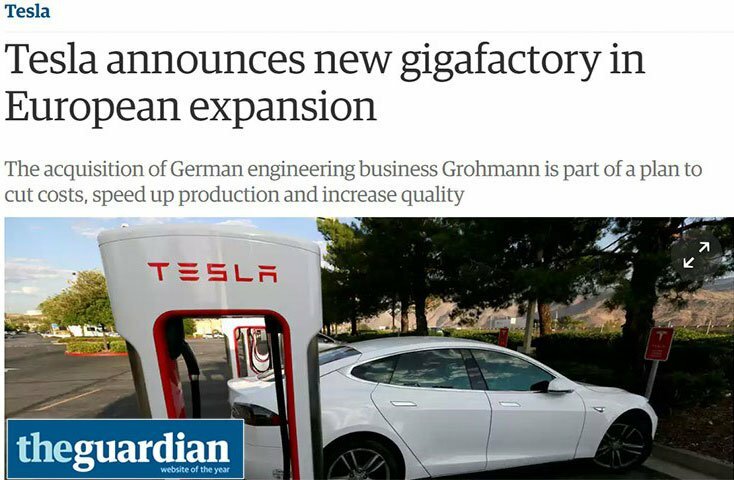 It is now a well-known fact that Tesla has built a huge ‘Gigafactory’ in Nevada, USA, in order to flood the US market with more efficient/faster/cheaper/sexier electric cars that are a step ahead of the current gasoline-guzzling vehicles every Government on earth loves taxing the bejesus out of. All in all, there is a very distinct possibility that electric cars (led initially by Tesla but joined by other manufacturers) will ram their gasoline cousins off the road altogether within the next generation. That’s not the end of the graphite demand story however. A further source of demand has arisen via expandable graphite for flammable retardant building materials that are gradually replacing toxic brominated products currently permeating millions of buildings worldwide. 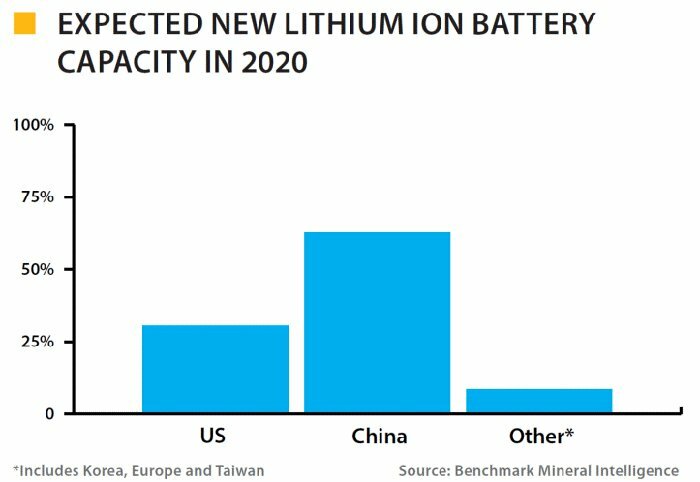 Regulatory changes in several populous regions such as China, the US and the EU have led additional graphite demand – as if lithium-ion batteries were not enough. 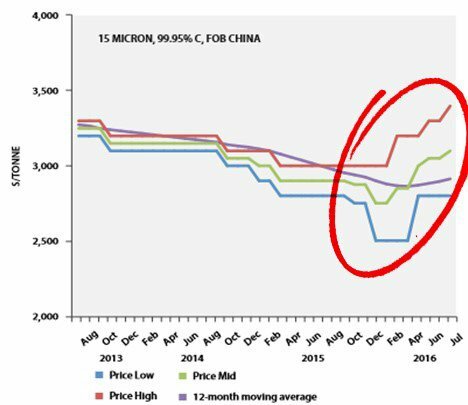 Regulatory changes in China and Europe have also put further upside pressure on natural flake graphite because of its preferred environmentally-friendly status compared to synthesised graphite. The graphite industry has multiple avenues of demand, and that’s not including graphene — a space-age derivative of graphite that could ruffle world markets in its own right; if and when it is harnessed to the full extent. However at the same time, investors should be aware that commodity prices do fluctuate. Caution should be applied and professional financial advice sought for any investment decision. The global battery wars have most certainly begun with Tesla already facing stiff competition from Chinese manufacturers that have an advantage due to domestic Chinese dominance in synthetic graphite supply. For ACP, taking an early position with a bulky resource could be a huge value driver and focusing on Europe as a final end-user market is also smart because of the high car ownership rates. The Mahenge Liandu Project has the potential to be a world-class graphite deposit — but ACP needs to collate more data and work up a competitive JORC Resource. For the time being, ACP has struck graphite mineralization 85% of the time during its most recent drilling round. There is more exploration work to be done, but a key checkpoint in the form of a maiden JORC Resource is within sight. ...and that’s exactly what would put this small-cap explorer on the graphite exploration map, and offer a worthy seat at the Cabo Delgado explorers table which already includes several flourishing ASX listed graphite explorers. ACP’s initial assay results demonstrate Mahenge Liandu as a high quality (and sizeable) graphite resource that will satisfy the highest world standards demanded by battery manufacturers or builders. Not only can ACP satisfy the technical requirements, it should also be noted that Tanzanian graphite is unique in having typically high flake size and can be easily processed using simple crushing and flotation — as opposed to synthetic or small-size flake graphite which typically requires more processing time and expense. 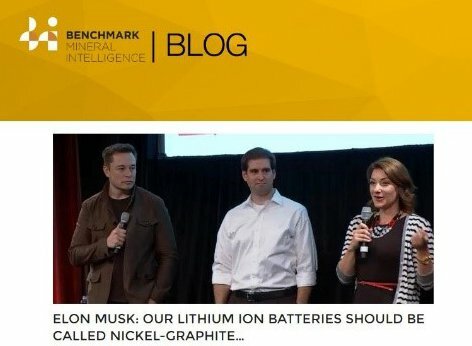 The good news is that downstream graphite end-users such as Tesla are increasingly showing a preference for graphite feedstock which is more environmentally friendly and doesn’t require complicated processing methods — as long as the price is right. Currently priced at around 4p per share and capped at £8.5 million — yet packing an almost certain JORC Resource before the end of the year – ACP could represent a valuable commodities investment.